That’s the shout I hear when the boys find cherries on the counter and eagerly pop them in their mouths and pull off the stems. They can’t resist the deep red fruits, and neither can I. Seeing their happy smiles with cherry juice all over their hands and faces is one of my favorite moments. 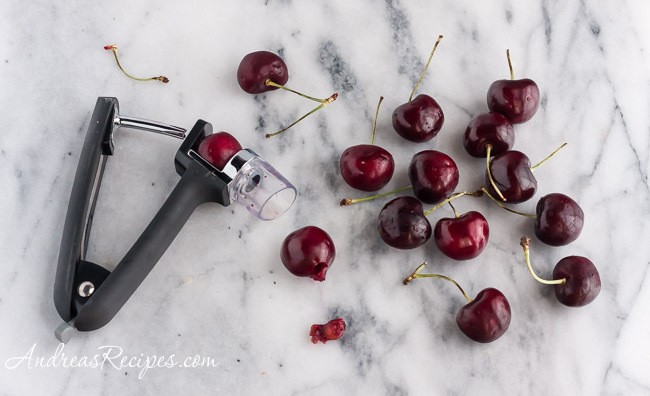 When I use fresh cherries in a recipe, I grab my handy Oxo Good Grips Cherry Pitter (not sponsored), which pops the seeds right out with minimal mess. It’s such a unitasker, I know, but it does the job very well and saves me loads of time when processing several bags of cherries. This makes the job so easy I would even turn it over to Builder Guy and Top Gun if I thought they’d actually leave some cherries for the rest of us. Though we mostly eat cherries out of hand, we also add them to ice cream and make pies and cobblers and this cherry butter. Like the other fruit butters I make, the thickness comes from cooking down the fruit, not added pectin. I add a little bit of vanilla extract which gives the butter a wonderful richness of flavor. 1. Pour the pitted cherries into the sauce pan and add the lemon juice. Bring to a boil, then reduce heat and simmer about 5 minutes. The cherries should be very soft and mashable. 3. 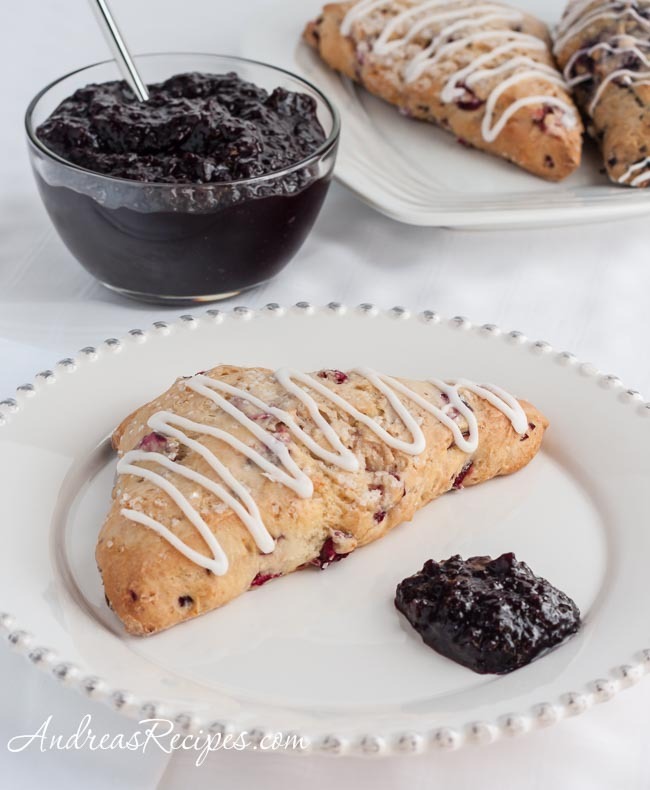 Return the pureed cherries to the sauce pan and add the sugar and cinnamon. Bring to a boil, then reduce the heat to low and simmer uncovered until the mixture is thick, about 25 minutes, stirring frequently. 4. Remove from heat and stir in the vanilla extract. 5. Cool completely and divide between the two freezer jars. Store jars in the refrigerator or freezer. Will keep for up to 3 weeks in the refrigerator and 3 to 4 months in the freezer. Sweet! 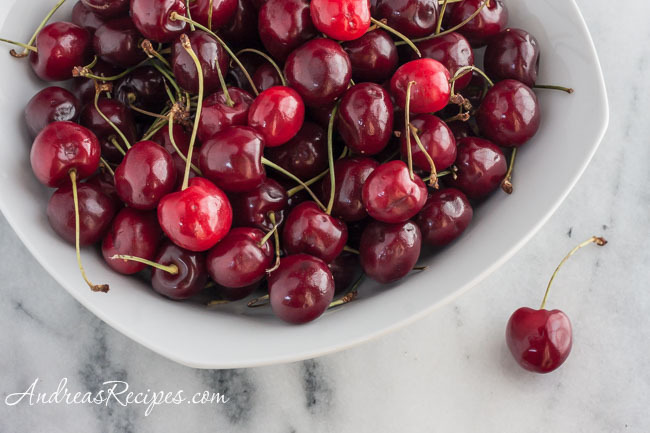 Always looking for a way to use my favorite fruit, fresh cherries! And I gotta get me one of those pitters- thanks again!! I love the look of this recipe. I am wondering if there is some reason you recommend freezing instead of canning. Is it safe to can this yumminess? Yes, you can use a hot water bath to can it, though at just two jars it is a small batch and might not be necessary. If you want to process it, I recommend the directions from the National Center for Home Food Preservation. Let us know how it turns out! did you have any problems with foam when you used the immersion blender? if so, how did you get rid of it? does it go away once you cook it down? Hi Amanda. I actually didn’t get any foaming with the immersion blender. If you get foam, just skim it off with a spoon. I have a huge bag of pitted frozen cherries… would that work as well? Hi Frederique. Yes, you can absolutely use pitted frozen cherries. I’ve used them in the cherry butter, and it works well, just let them thaw in the bag or in a bowl and pour all the juices in with the cherries when you get ready to cook.